Hunting Season had recruited a loyal online army of Creme Egg fanatics. And we wanted to surprise them with a real-world experience. So we did the extraordinary and built a Creme Egg hunter’s paradise in the corner of East London – a giant forest called Creme Egg Camp. 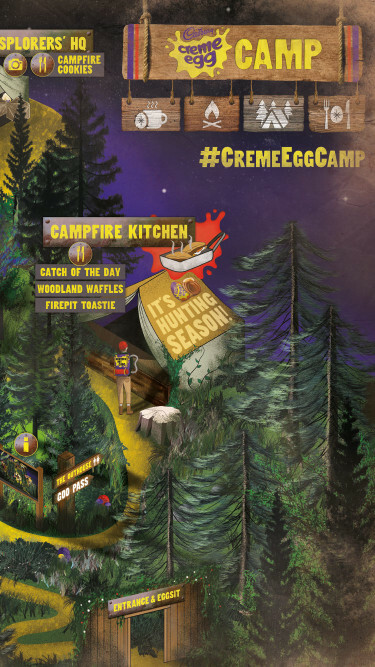 Camp was not only a hunting ground for goo-tastic Creme Egg dishes and the perfect stage for social content, but also the secret hiding place of the coveted White Creme Egg! We even delivered campfire dishes outside of Camp with an exclusive Deliveroo partnership. Fans loved it. The press were all over it. And to top it off, sales grew 22%.